Jack Gordon is a former chief editor of Training Magazine and an award-winning writer. He is the editor of numerous books, including The Pfeiffer Book of Successful Communication Skill-Building Tools and The Pfeiffer Book of Successful Leadership Development Tools. 2. 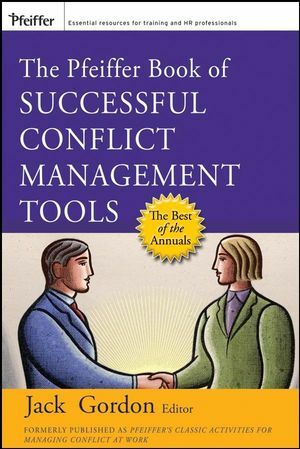 Conflict-Resolution Strategies (Joan A. Stepsis). 4. A Taxonomy of Intergroup Conflict-Resolution Strategies (Daniel C. Feldman). 16. Winterset High School: An Intergroup-Conflict Simulation (Charles E. List). 17. Crime-Fighting Task Force: Understanding Political Tactics in Groups (R. Bruce McAfee and Robert A. Herring III). 20. Lindell-Billings Corporation: A Confrontational Role Play (Thomas H. Patten, Jr). 4. Trust-Orientation Profile (Myron R. Chartier). 5. Conflict-Management Style Survey (Marc Robert). 8. The Defensiveness Inventory (Beverly Byrum-Robinson and B.J. Hennig).